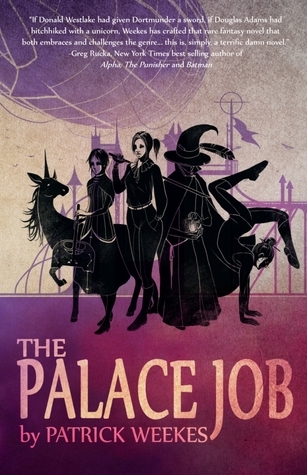 Today I have an interview with Patrick Weekes, author of the recently released The Palace Job. I’m a big believer in outlines. I work as a video-game writer for a living, and you absolutely cannot be part of a team of 100+ people working on a game if you’re going to write something by the seat of your pants. I’m also a father of two very active young boys, so I don’t have a ton of time to write. When I get two hours to sit down at the keyboard, I can’t afford to spend the first hour wondering what my heroes are going to do next. When I first start plotting a book, I’ll get a couple of bullet points in each chapter noting what needs to happen to move people from Point A to Point B, and from B to C, and so on. Once I’m getting started on an act, I’ll move from general bullet points to a specific list of which scenes each chapter needs. I need a scene from the villain’s POV to establish the tension and remind the reader what the villain is doing. I need something from this hero to show what they think about the plot twist that just happened. Now, as a point of clarity, the final product will often (read: always) deviate wildly from what I’ve got outlined. The point of the outline isn’t to lock me into a course of action. It’s to give me guidelines, so that when I hit the next scene, I have something ready to go to immediately… and if I look at what I’d put down in the outline and go, “Nope, actually, I need to do something totally different now,” then at least I’m making a reasoned choice instead of flying by the seat of my pants. Do you write your book from page 1 to the end, or do you jump around? I almost always write chronologically from the start to the finish. With all this outlining I do, I could theoretically write things in any order I like, but in practice, I need to feel the flow of the scene and adjust the outline as I go. What input, if any, did you have in the cover design? Tina Moreau and Margaret Curelas talked to me in detail about what I had in mind for the cover. Because this is my first novel, I didn’t want to be a diva about how my cover looked. At the same time, I’ve had friends end up angry with their publishers when their non-white heroes got whitewashed on the cover of the book. I really wanted to avoid that with my heroine, Loch, even if that meant going with a simple cover that just had a hat or a sword or something. I also hoped to get a cover that showed Loch as a tough, confident character, a former soldier who fights like a boxer and not a dancer. In my wildest dreams, I’d hoped to get something like a cast picture, since the novel is at its core a heist caper with a large team… but I knew that that was a long shot. As it turns out, I couldn’t be happier with the cover. We have Loch, who is holding a sword, wearing pants, and can be identified as a person of color even in stylized silhouette form. We’ve got Desidora looking pretty and prim and wielding the truly badass warhammer Ghylspwr. We’ve got Hessler in his robes and the acrobatic Icy in a beautifully ludicrous pose. We’ve even got Ululenia the unicorn, and I would have bet any amount of money against getting a unicorn onto the cover of a heist novel. Lili Ibrahim did a wonderful job showing the team in all their coolness and absurdity, and I absolutely adore the way she uses color and silhouettes to bring the magic of the world to the page. Which of your characters is your favourite? Argh, this one is tough. I could go with Loch, because it was my first time trying to write a person of color as the main character, and it was a fascinating experience trying to get out my own white-male head and write someone different. I could go with Ululenia, because, to repeat myself, I have actually gotten a unicorn into a heist caper, and I’m going to carry that with me for the rest of my life. But honestly, my favorite character is probably Kail, because he was the one I had the most fun writing. I’ve always had a soft spot for the least overtly powerful person on the team, be it Xander in the Scoobies or Hawkeye in the Avengers, and in The Palace Job, I’ve got a hammer-wielding death priestess, a telepathic unicorn, a master tactician and swordswoman… and then I’ve got Kail, who has a good right hook and an affinity for trash talk. The fact that he’s willing to help Loch on this insanely dangerous job, and the way he’ll insult the mother of an ancient immortal creature because it is literally the only thing he can do to help in that situation… well, it’s probably a bit closer than I like to admit to the way that I approach life, and it’s a ton of fun to write. What drew you to the idea of a fantasy based heist? I used to read mysteries as a kid. I could burn through a Hardy Boy book in a couple of hours, in fact. Then my mom introduced me to fantasy novels, and I jumped onto the sword and sorcery bandwagon and left the mysteries behind for awhile. And hopefully we’ll find out the answer to that soon. Thanks so much for being here and answering my questions. Patrick Weekes is a writer, a martial artist, and one of the foremost hot chocolate connoisseurs of Canadian prairie region. When not making things explode in his work as a video-game writer at BioWare, he spends most of his time blasting bad guys online with his wife, doing something Lego-related with his children, or negotiating with the pets for space on the bed. The most powerful man in the republic framed her, threw her in prison, and stole a priceless elven manuscript from her family. With the help of a crack team that includes an illusionist, a unicorn, a death priestess, a talking warhammer, and a lad with a prophetic birthmark, Loch must find a way into the floating fortress of Heaven’s Spire–and get past the magic-hunting golems and infernal sorcerers standing between her and the vault that holds her family’s treasure. It’d be tricky enough without the military coup and unfolding of an ancient evil prophecy–but now the determined and honourable Justicar Pyvic has been assigned to take her in. But hey, every plan has a few hitches.